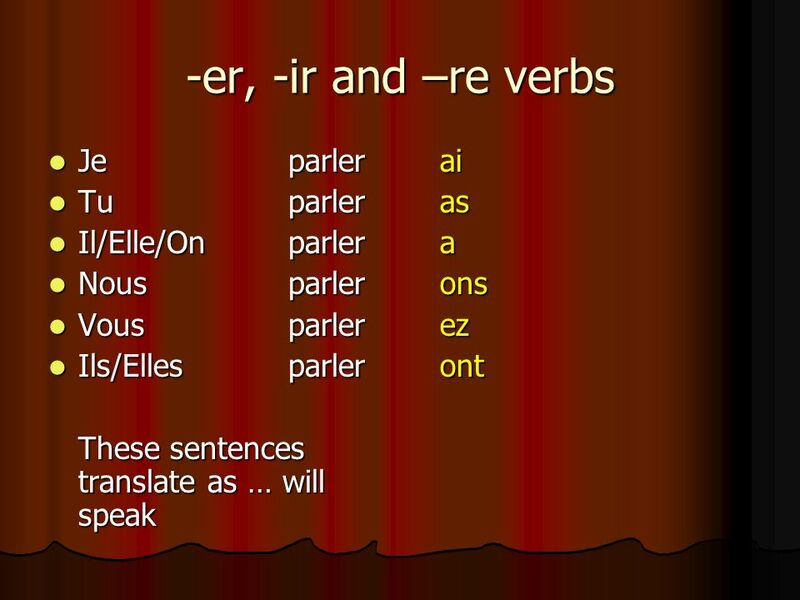 Traduisez en anglais? Je vais me marier un jour. 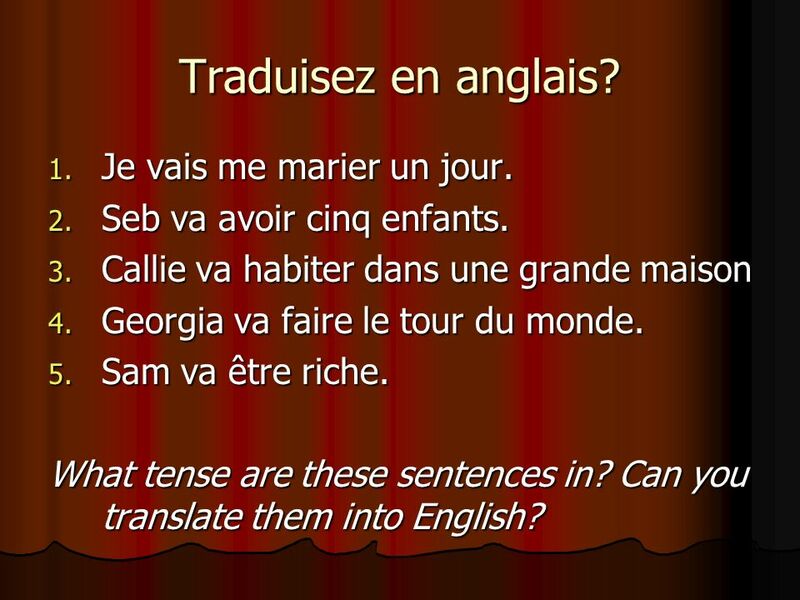 1 Traduisez en anglais? Je vais me marier un jour. Seb va avoir cinq enfants. Callie va habiter dans une grande maison Georgia va faire le tour du monde. Sam va être riche. 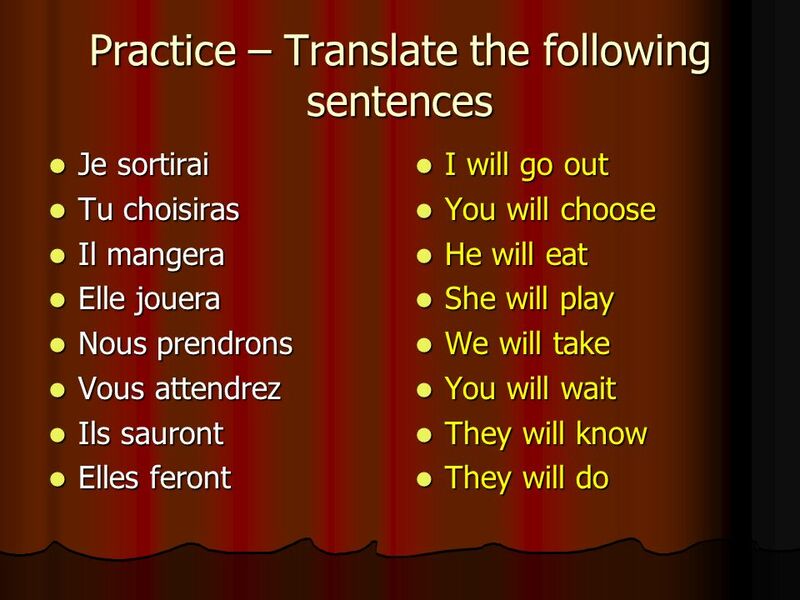 What tense are these sentences in? Can you translate them into English? 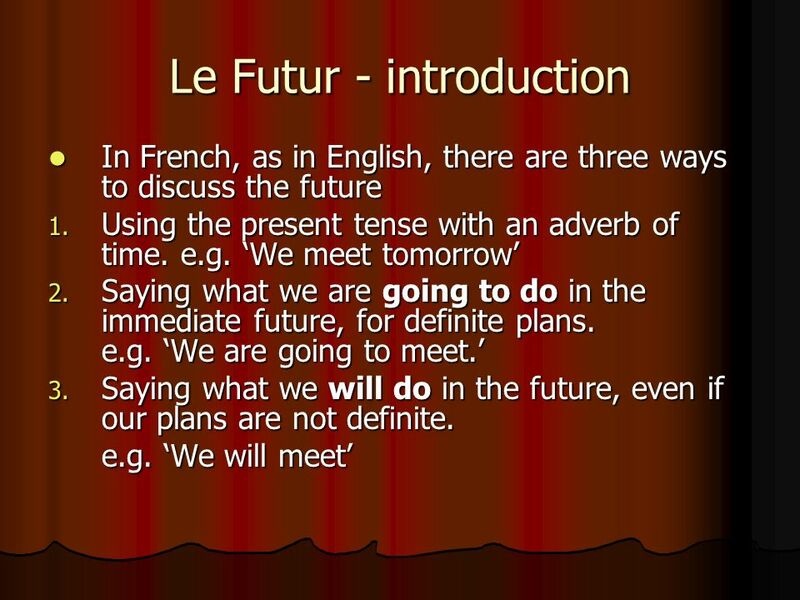 This is a form of the future used more in French than in English. 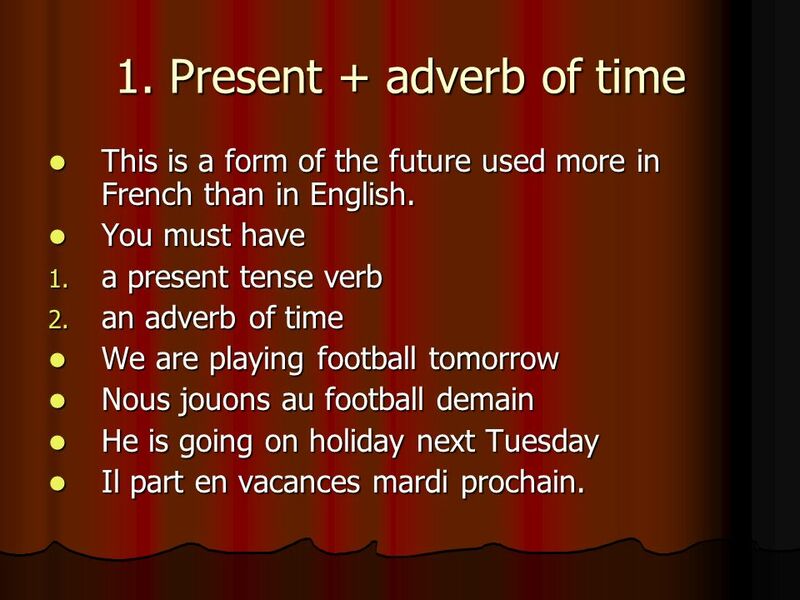 You must have a present tense verb an adverb of time We are playing football tomorrow Nous jouons au football demain He is going on holiday next Tuesday Il part en vacances mardi prochain. 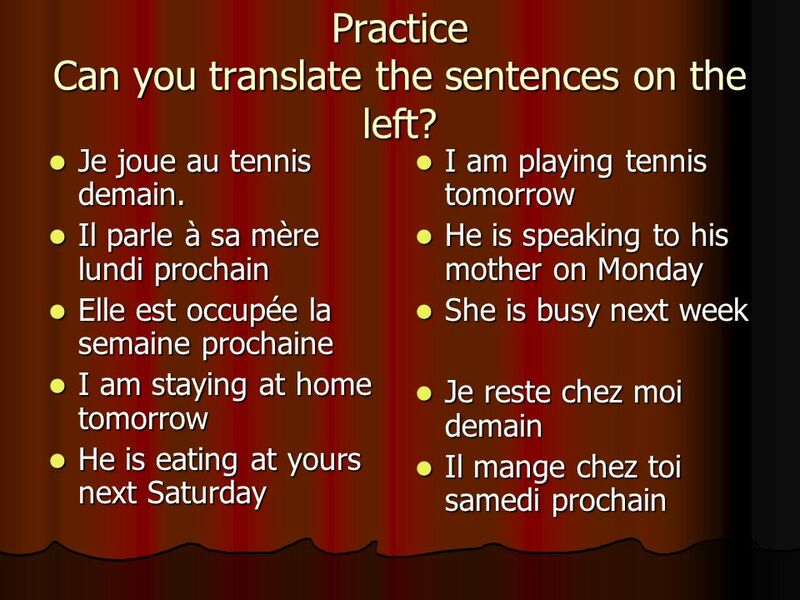 5 Practice Can you translate the sentences on the left? 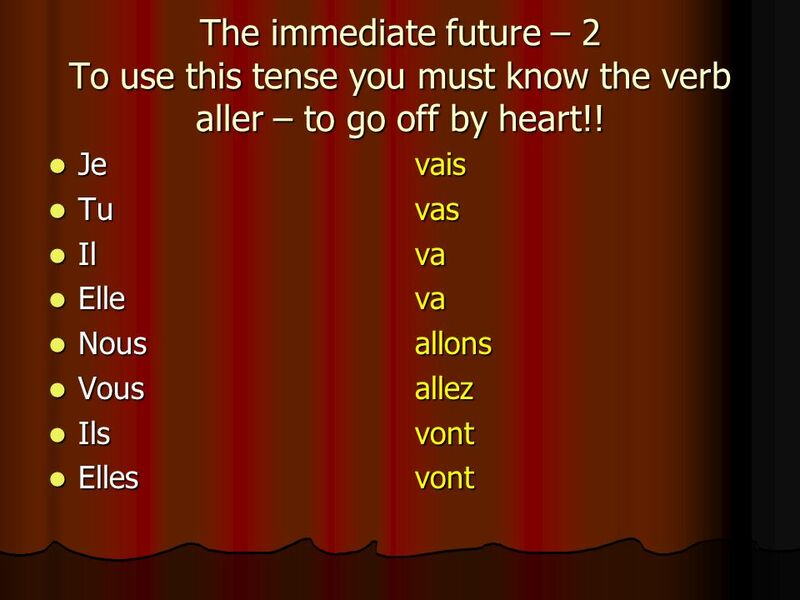 7 The immediate future – 2 To use this tense you must know the verb aller – to go off by heart!! 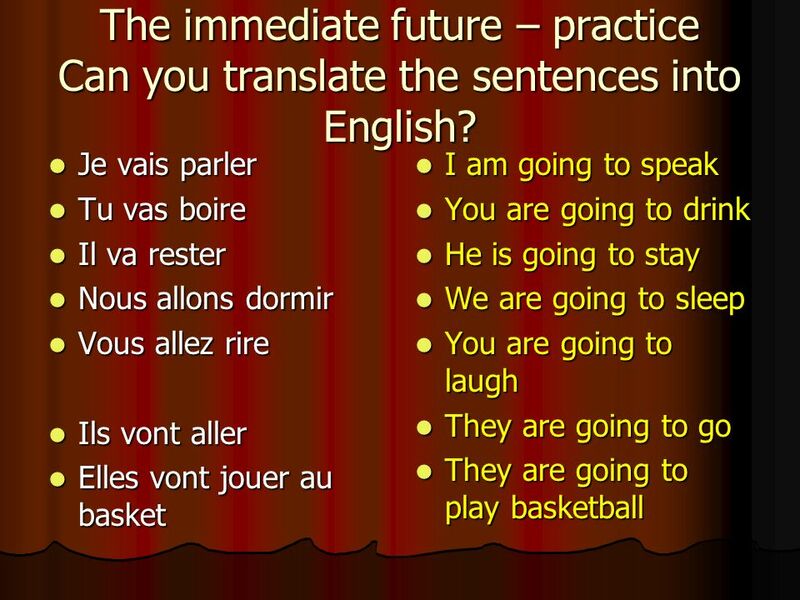 8 The immediate future – practice Can you translate the sentences into English? 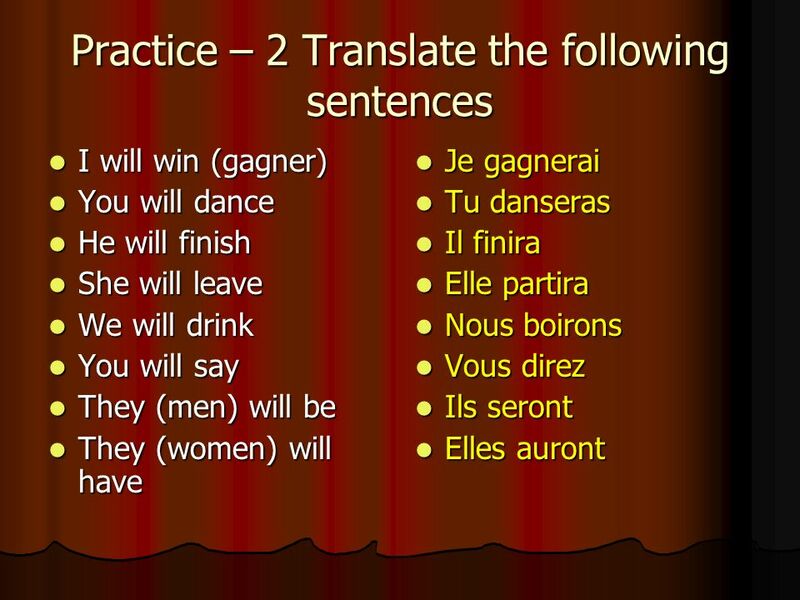 9 Practise -2 Can you translate into French? 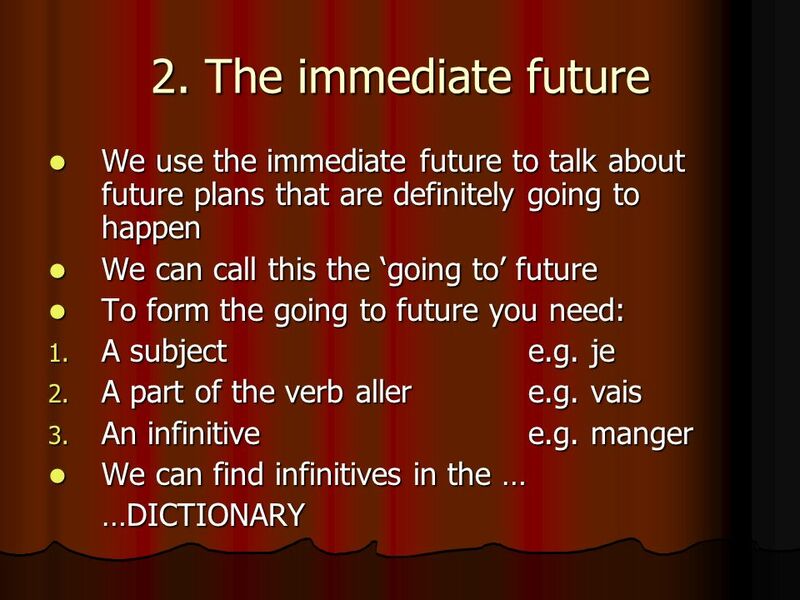 The third way to talk about the future expresses what we will do in the future. It is less definite. 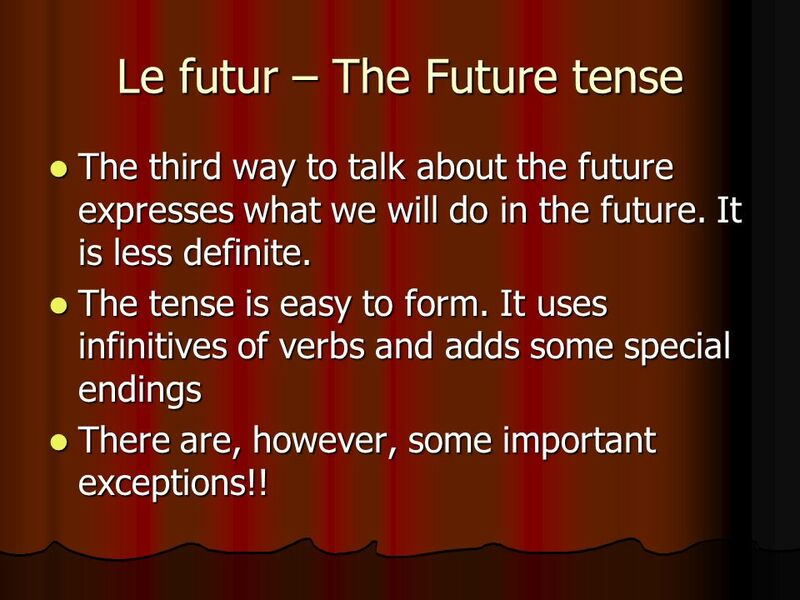 The tense is easy to form. 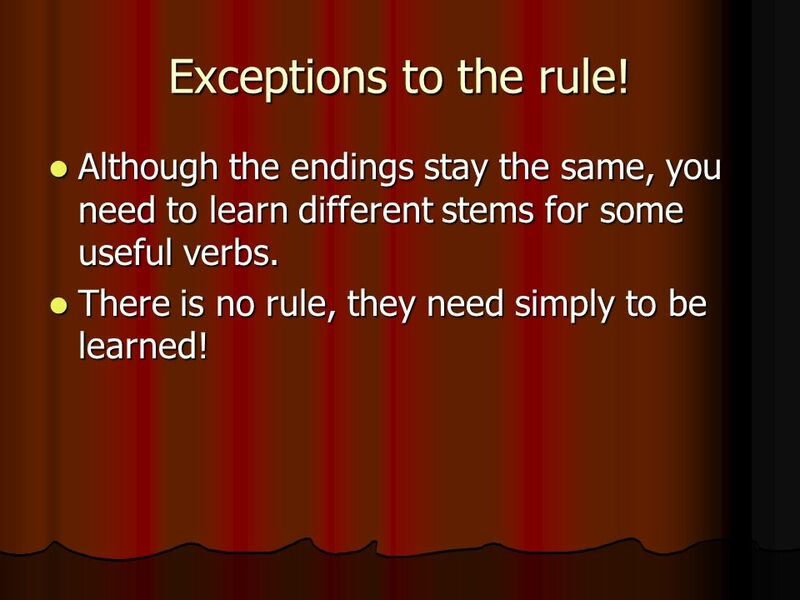 It uses infinitives of verbs and adds some special endings There are, however, some important exceptions!! 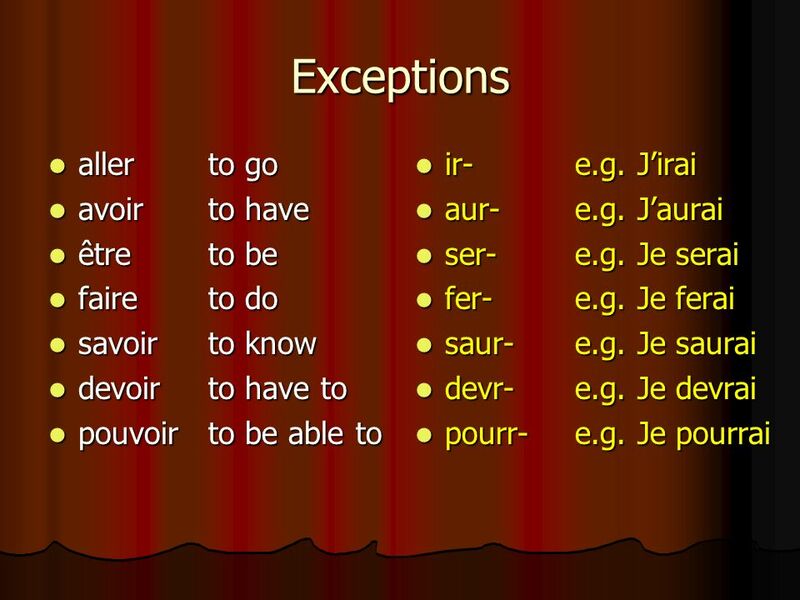 13 Exceptions to the rule! 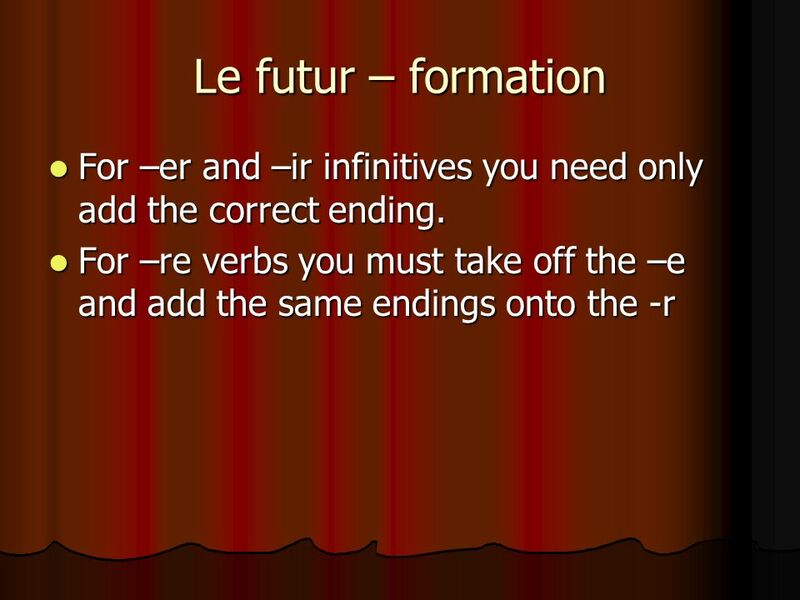 Although the endings stay the same, you need to learn different stems for some useful verbs. There is no rule, they need simply to be learned! 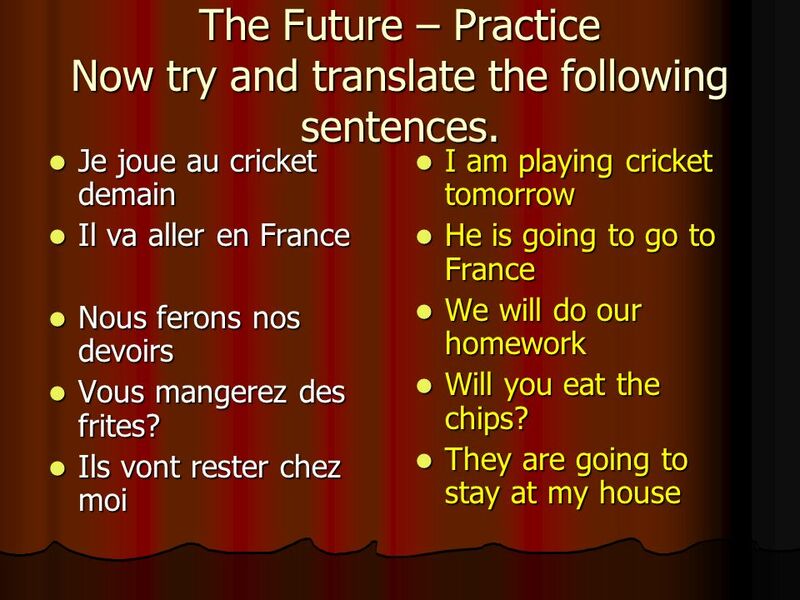 17 The Future – Practice Now try and translate the following sentences. Are you (a friend) swimming tomorrow? She will play We will like They (men) are going to go to town Je vais boire Tu nages demain? 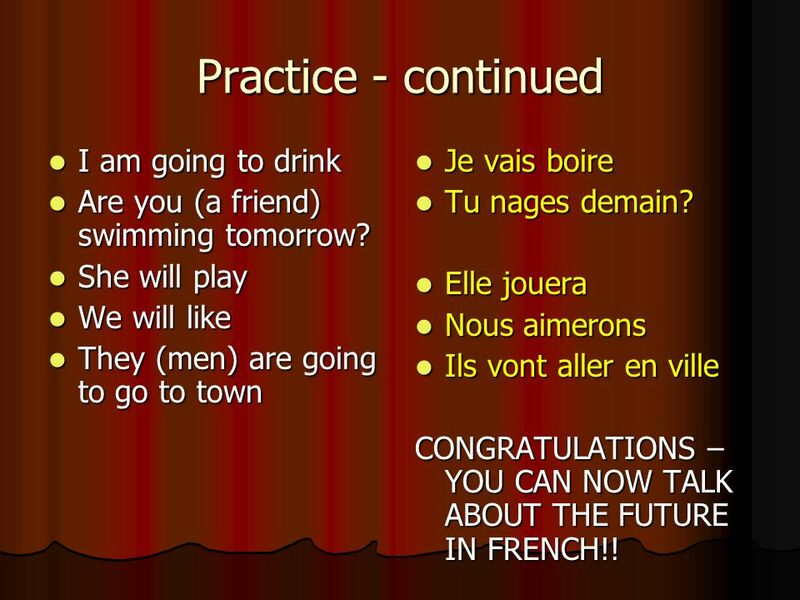 Elle jouera Nous aimerons Ils vont aller en ville CONGRATULATIONS – YOU CAN NOW TALK ABOUT THE FUTURE IN FRENCH!! 19 Just a small point! 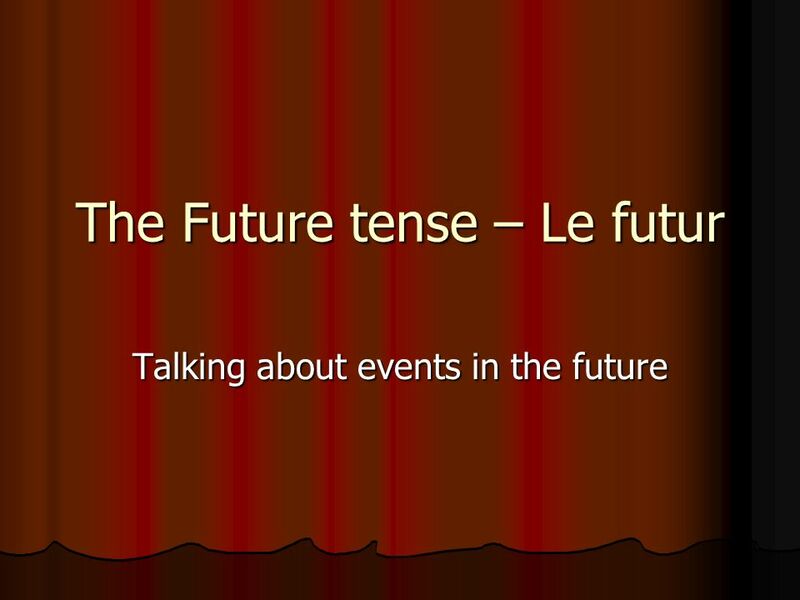 The conditional which translates as ‘would’ can be formed very simply when you know the future tense! 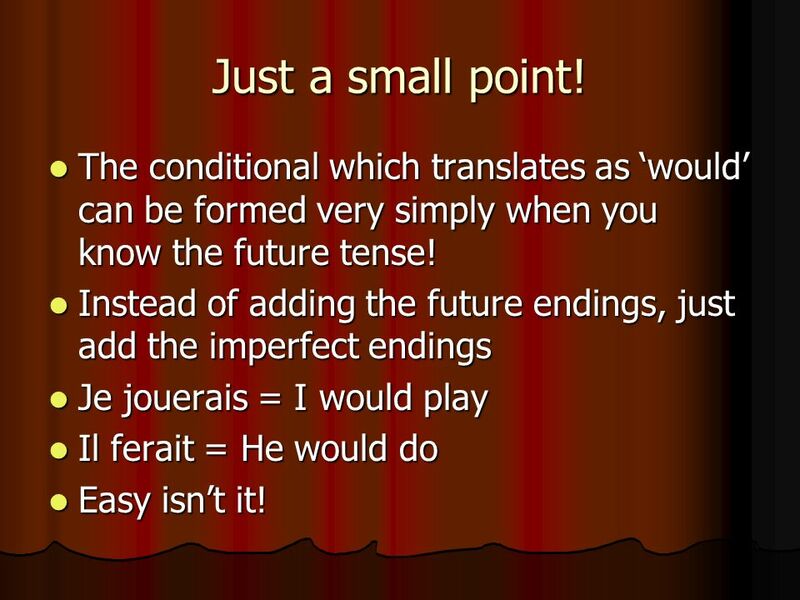 Instead of adding the future endings, just add the imperfect endings Je jouerais = I would play Il ferait = He would do Easy isn’t it! 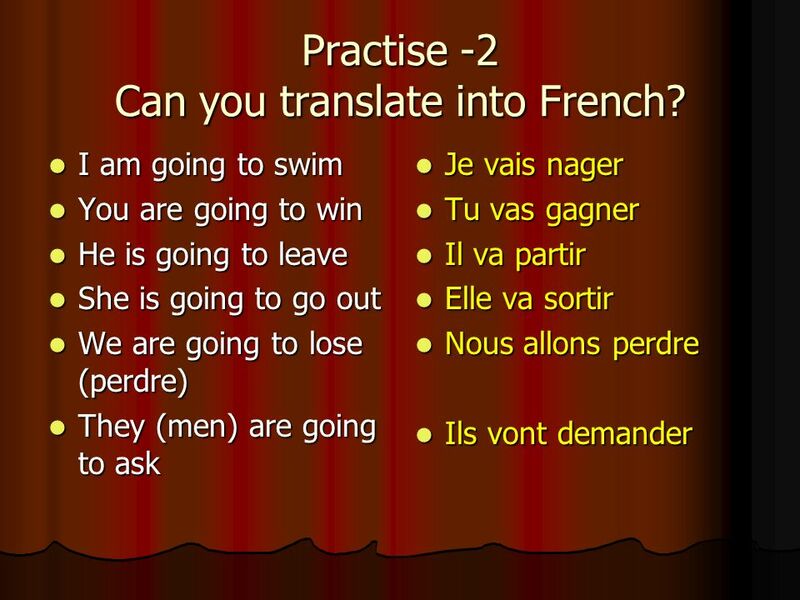 Download ppt "Traduisez en anglais? Je vais me marier un jour." 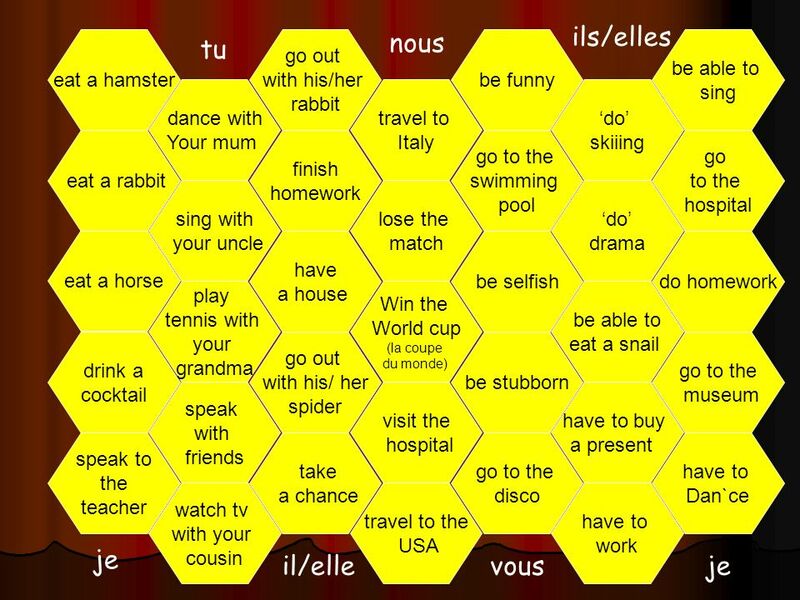 The Conditional Tense Being able to use the conditional tense is very impressive. Verbes en -er Madame Dabla.